Feedback review feature is an amazing solution for your monthly, quarterly, annual reviews & 360 appraisals. Firstly, you should check out Settings > Performance > Feedback. 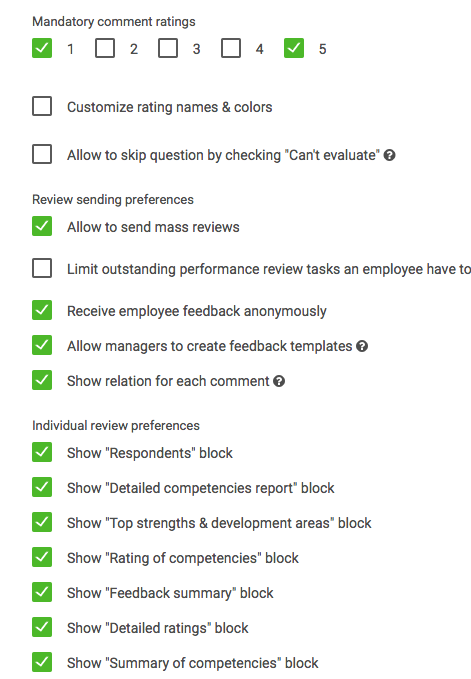 Here you can add & edit the categories (competencies). To save you time & energy, all categories with their descriptions will appear in a dropdown menu when creating a new review template. You'll be able to add as many questions under a specific category, as you wish. Scroll to the bottom to adjust the Feedback settings to your liking (see image below) & don't forget to save your preferences. These are global settings and will apply to all Feedback reviews you create. Now that you've adjusted your preferences, let's create a new Feedback review!